Set 2.8 km from National Taichung Theatre and 3 km from Taichung Football Field, wwroom28 offers accommodation located in Xitun. The property is 3.1 km from Taichung City Government. The homestay is fitted with a flat-screen TV. Private parking is available at the homestay. Shin Kong Mitsukoshi Taichung Zhonggang is 3.5 km from wwroom28, while LEECO Outlet Taichung is 3.6 km away. Taichung Ching Chuan Kang Airport is 13 km from the property. 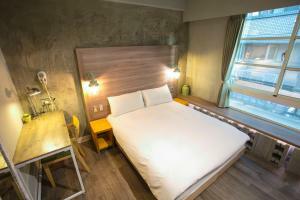 When would you like to stay at wwroom28 ? Each day we'll check prices and send you an email for your selected dates at wwroom28. If you don't have specific dates but would like to check prices for say next weekend or say next month we can check the price too. Click to write a review and share your experience of wwroom28 with other travellers. No. 40, Ln. 150, Wenhua Rd.